As kids, we would often hear our parents, teachers and mentors tell us that the sky was the limit. While many of us have carried, and continue to carry, that motivational expression close to our hearts, one Drexel University alumnus, astronaut Chris Ferguson, didn’t limit himself to just the sky. Instead, the Class of ’84 graduate shot for the stars and went to space — three times, to be exact. And come 2019, he will return for his fourth journey to the International Space Station, located about 254 miles above the Earth’s surface. Ferguson, 57, is one of nine astronauts selected by NASA to participate in its first space launch from U.S. soil in seven years. Since then, space travelers have been launching into orbit on the Russian Soyuz spacecraft from Baikonur Cosmodrome in Kazakhstan. 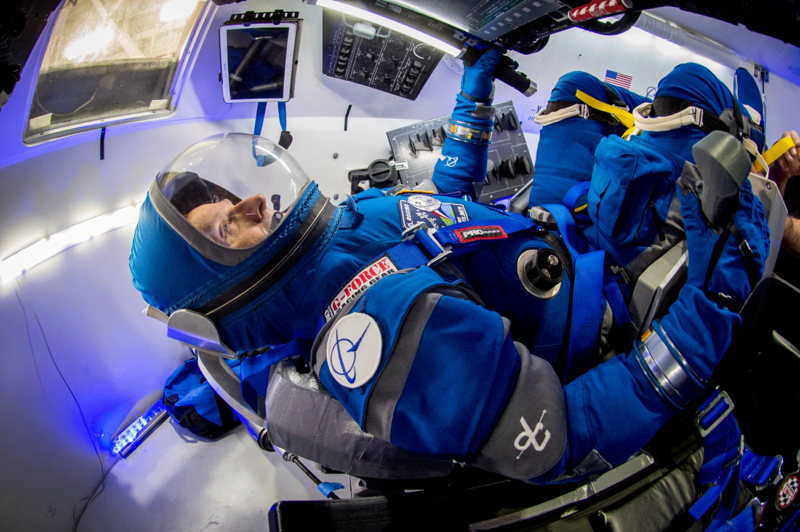 He will serve as a test pilot on the first flight of Boeing’s newly-developed commercial spacecraft, the Boeing CST-100 Starliner capsule. The spacecraft — launching from Cape Canaveral, Florida in 2019 — will fly Ferguson, NASA astronauts Eric Boe and Nicole Aunapu Mann and a cargo of time-critical biological research to the ISS. This first-of-its-kind journey is part of NASA’s Commercial Crew Program, which aims to develop and operate innovative spacecrafts and launch systems capable of carrying crews to low-Earth orbit — the space within 100 and 1,240 miles above Earth — and the ISS. To achieve the program’s mission, NASA awarded contracts worth billions to aerospace manufacturers Boeing and SpaceX in 2014; they were given the competitive task of building their own spacecrafts — engaging in a sort of domestic space race. Fast forward to four years later, NASA assigned a group of astronauts to fly the spacecrafts—Ferguson being one of them. Among the nine space explorers, Ferguson is the only non-NASA astronaut—dubbing the Philadelphia native as the first “corporate astronaut.” A Boeing commercial astronaut, Ferguson could be the first private citizen to fly to space on a commercially operated spacecraft. Ferguson, who earned his bachelor’s degree in mechanical engineering, joined NASA’s astronaut corps in 1998 after climbing the ranks of the Naval Air Force. With NASA, he has flown three space shuttle missions, accumulating more than 40 days in space. In 2006, his first 12 days in space were spent piloting the space shuttle Atlantis. Two years later, he flew again to low-Earth orbit aboard space shuttle Endeavour. Then, in 2011, he once again piloted Atlantis on its last journey to the ISS before NASA stopped its space shuttle program. That same year, Ferguson retired from the federal space agency. Not too long after Ferguson ended his tenure at NASA, Boeing recruited him due to his vast experiences as a pilot and engineer. As director of Crew and Mission Systems at Boeing, Ferguson incorporates his engineering skills by building upon the current operations concept and helping refine the design of the CST-100 — a task he feels is geared to him due to his extensive experience operating vehicles designed for human space travel. In any case, the ultimate goal for NASA,for Boeing, for SpaceX is to commercialize space flights and to provide ordinary people with an experience that only a select few have been able to witness. Although the next American space launch may be revolutionary, Ferguson believes there are still some things to figure out before space travel becomes open to the public. In the meantime, Ferguson will continue to live out his childhood curiosity in preparation for his fourth space journey. Wendy Plump, staff writer for the College of Engineering, conducted the interview with Ferguson and agreed to share her interview notes with The Triangle.